The selection of Brandon del Pozo (center) as Burlington's next police chief prompted a group of residents to seek greater oversight of city police. Sandy Baird, a lawyer and longtime activist, sat with two dozen other local residents Monday night trying to figure out how Burlington hired a new police chief despite some residents' misgivings and what, if anything, they can do about it. “I wonder why this happened, why we got this guy, why the mayor was so anxious to push this through,” Baird said at a meeting at the Peace & Justice Center in Burlington. Two weeks after the Burlington City Council unanimously confirmed Brandon del Pozo as the city’s new police chief, some residents remain infuriated at a process they say was rushed, ignored their concerns and leaves them mistrustful. Del Pozo, 40, was chosen after a months-long search involving a field of about 30 candidates seeking to succeed retiring chief Michael Schirling. Del Pozo is slated to start work September 1. Del Pozo has spent his 18-year career with the New York City Police Department. That raised suspicion among some about whether he was part of controversial NYPD practices over the years. As those concerns arose, requests that the council delay its July 13 vote went unheeded, said Mark Hughes of Cabot. “Honestly, I smell a rat,” Hughes said. A graduate school paper del Pozo wrote on racial profiling surfaced the day after Mayor Miro Weinberger announced del Pozo was his choice. The paper, and other questions, caused some question del Pozo’s views. Some in attendance Monday night wanted the city to reopen the search process, but they quickly acknowledged that was unlikely. They settled on breaking up into groups to discuss ideas. One subgroup planned to look into whether the city followed the hiring process to the letter of the law. Another agreed to push for more diversity training for police and city officials. Another group planned to monitor police behavior. Baird criticized the appointed city police commission as an ineffective overseer. “They’re all mouthpieces for police,” she said. Her concerns precede del Pozo, she said, citing a 2012 protest in which Burlington police fired rubber bullets and pepper spray at protesters. She also cited a no-trespassing ordinance on Church Street that she is challenging in court as an indication of the city’s willingness to give police too much power. “I’m done trusting people in positions of power,” said FaRied Munarsyah, who argued that the search process was conducted by insiders and not as well publicized as a typical winter parking ban. As the audience listed complaints, Burlington Councilor Sara Giannoni (P-Ward 3) stood at the front of the room, keeping track of their comments on a white board. The only council member there, she was straddling an uncomfortable line. 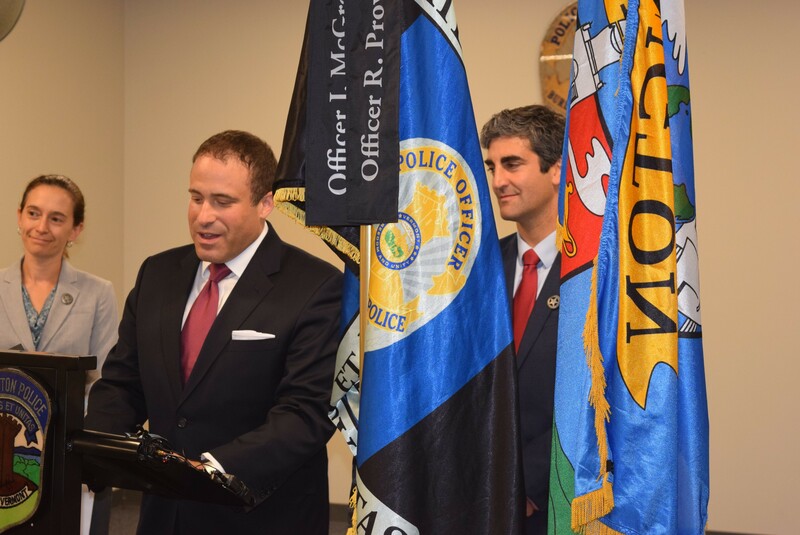 Newly elected to the council in March, Giannoni was on the committee that chose del Pozo as the city’s next police chief. She had thought he was a terrific candidate, chosen through a sound process. Then the public unleashed a torrent of complaints and Giannoni began to feel the process wasn’t that terrific after all. She asked if the council could delay its vote to give the public more opportunity to be heard. When that didn't happen she joined in the 11-0 vote to confirm del Pozo's appointment. Since then, Giannoni has been hearing from a stream of critics. At Monday night’s meeting, she was the target of some of the group’s comments. "It's intense," Giannoni said afterward. “The city council — how could you vote unanimously?” asked Hughes. As the meeting wrapped up, Hughes hugged Giannoni. “Just you being here says everything,” he said. Giannoni told the group that the council’s public safety committee, which she chairs, will hold public meetings with del Pozo in the coming weeks.